The Caravan has been in production for over 25 years. It is a proven reliable workhorse with low operating costs. More than 1000 Caravans have been manufactured. They have been flown in almost every part of the world by civilian government and military organisations. The newest Caravans come equipped with the very latest technology in flight instruments. It has excellent hazard avoidance abilities to help the crew see and avoid dangerous weather terrain and other aircraft. The Airkenya Express Caravans are configured to carry up to 11 passengers and the cargo pod underneath will hold all the baggage. The Caravan has a Pratt Whitney engine. It is one of the most popular turbo-prop engines in history. They are known for their extremely high reliability. The aircraft can cruise at up to 320 Kph / 200 mph and has a maximum range of 2000km /1240 miles. It is flown by two fully rated and trained Airkenya Express crew members although it is certified to fly with just one crewmember. The crew are given Flight Safety training in a full motion simulator before being released for command. DeHavilland aircraft are renowned for their rugged construction reliability and versatility. Coupled with the reliability of the Pratt and Whitney PT6 turboprop engine they are a force to be reckoned with. The Twin Otter is no exception and they are used by as diverse operators as the U.S. Army and the British Antarctic Survey. The Twin Otter was designed to operate in short unprepared strips in Northern Canada and can carry up to 1.5 tons of cargo. This makes it an ideal aircraft for our game park network and also for transporting film crews with their equipment. 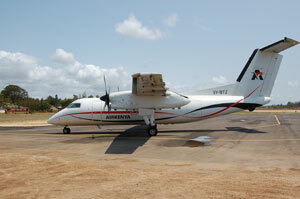 Airkenya presently operates three Twin Otters. As with other DeHavilland aircraft the Twin Otter is a "STOL" aircraft. "STOL" stands for "Short Take-off and Landing". These versatile aircraft are able to operate from all the airstrips on our schedule network. The Dash-7 is no exception and are used by as diverse operators as the U.S. Army and the British Antarctic Survey. The Dash-7 was designed for high-density short fieldwork with an emphasis on comfort. It is a pressurized single aisle aircraft with a seating capacity up to fifty 50 passengers. it can be used as a cargo aircraft carrying a load of up to 4.5 tons over distances of five hundred miles. It can fly at heights of up to 24000 feet and at speeds varying between 100 to 230 miles an hour. Airkenya presently operates one Dash-7s. As the Dash-7 is primarily used for passengers we have limited our capacity in each aircraft to a maximum of fifty seats thus ensuring the best seat pitch available. This configuration provides maximum usefulness without impinging upon passenger comfort. As with other DeHavilland aircraft the Dash-7 is a "STOL" aircraft. "STOL" stands for "Short Take-off and Landing". These versatile aircraft are able to operate from all the airstrips on our schedule network. Airkenya also avails aircraft for charter work and we have been as far afield as Khartoum Addis Ababa Asmara Djibouti and the Seychelles. The Dash-7 is ideal for large groups wishing to travel together and is regularly used by Travel Agents who specialize in incentive group travel. 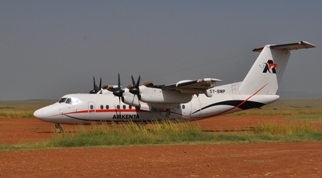 Please reconfirm with AIRKENYA Operations on email: operations@airkenya.com for status of both Dash 7. DeHavilland aircraft are renowned for their rugged construction reliability and versatility. Coupled with the reliability of Pratt and Whitney turboprop engines they are a force to be reckoned with. The Dash-8 is no exception and is used by many airlines all over the world. It is a pressurized single aisle aircraft and was designed primarily for the high-density commuter network with an emphasis on comfort. 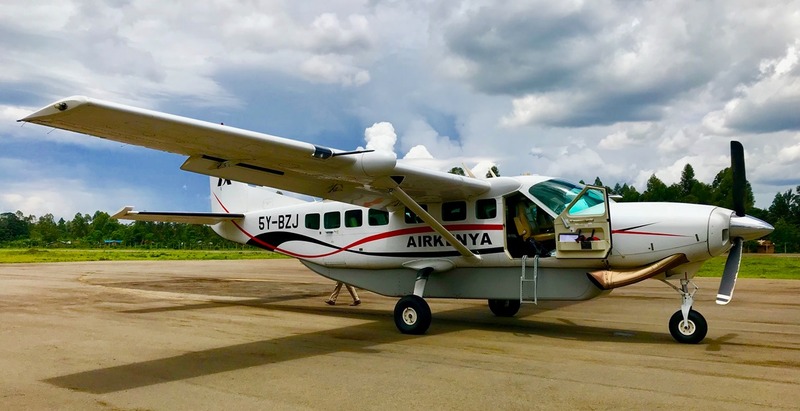 The Dash 8 can fly at heights of up to 25000 feet and cruises at speeds of up to 270 miles an hour putting destinations such as Lamu Malindi Mombasa and Diani in easy reach with flight times of just over one hour which coupled with our 45 minute check in time makes for a relaxed and enjoyable trip.